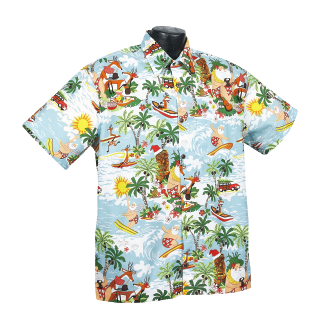 Men's Hawaiian Aloha Shirts → Surf,Waves,and Woodies → Tiki Christmas!! A very Tiki Christmas. Have you ever wondered what Santa Claus does after delivering all those presents? This vintage inspired tiki print shows Santa's South Pacific getaway..This shirt is made of 100% combed cotton and is made in the USA. It features matched pockets, real coconut buttons, double-stitching, and side vents so shirt can be worn outside or tucked in. The price is $57.95 for sizes S,M,L, and XL, $59.95 for XXL, 61.95.95 for XXXL, and $63.95.95 for 4xl.